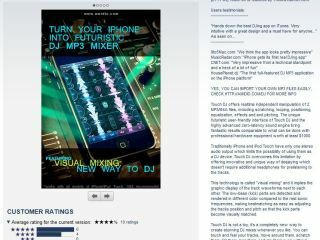 Amidio releases new MP3 mixing app for Apple iPhone for budding superstar DJs everywhere! If you fancy yourself as a bit of a superstar DJ (and hey - who doesnt these days!?) then a new iPhone app that lets you mix MP3 or M4A files is sure to rock your world. Amidio's £11.99 app basically turns your iPhone into a virtual turntable. The developer is claiming that it is the first true MP3 iPhone and iPod touch app available. Not content with just mixing two tunes together, users (i-Js?) can also scratch, loop and mess around with equalisation, effects and pitch. Pretty cool, although there is one significant downside to the app as it stands – users have to reupload any MP3s or M4As that they wish to mix with into the application itself. That's right – you cannot just choose any of your tunes from your iPod library.